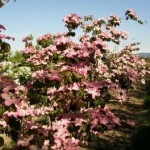 A selection with strong upright growth, that features attractive horizontal branching as it matures. The bracts are a rose-pink: color will vary with temperature and growing conditions. It can develop red fruits in the fall. The fall color is a deep red. It is disease resistant. 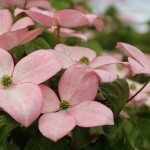 It is best planted in a rich, organic, well-drained soil in full sun to part shade.